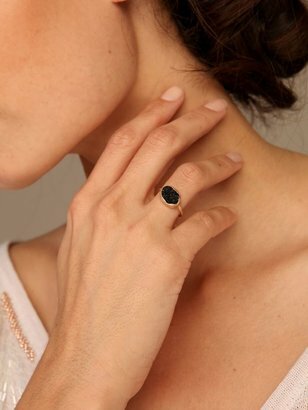 Handcrafted by Melissa Joy Manning, this limited-edition ring features a stunning black druzy agate set in 14kt gold atop a hammered band. $468 at FreePeople.com. If you can't spring for the real deal, Forever 21 has a similar style ring called the Crystal Rock Ring for $10.80 in either black or purple faux-crystal. The green is already sold out so I imagine this popular style will sell out quickly. Click any image to shop. I've been debating on buying that ring. The green was so pretty. Now, I guess I need to jump on the purple.